For starters, it’s HBO. If they can’t figure out how to communicate something to the masses, nobody can. (And by the way, guess who bought the rights to the Henrietta Lacks book? You got it, HBO — which means you can probably look forward to something as good as the book). Each episode is generally made up of four or five roughly 10 minute segments, each a completely independent story. But the secret of the show is that after a while you begin to realize it has very little to do with sports. The segments are almost always great HUMAN stories which tend to focus on single individuals. Often they are classic stories of ordinary people achieving extraordinary success, as was the case a couple weeks ago with the segment they did about the Oakland A’s pitcher Dallas Braden who is the most average of guys, came from the working class town of Stockton, California, achieved very little of note in four years in the major leagues until out of nowhere he pulled off a near-miracle by retiring all 27 batters in their game against the best batting team in the league, the Tampa Bay Devil Rays. And then, the icing on the story, he stood up for all the “ordinary” guys when he barked at one of the extraordinary players, Alex Rodriguez of the Yankees, when he walked across “his” pitching mound. Those are the types of stories they present. Or they tell tales of falling from greatness, as they have for so many top level athletes who fall victim to drugs and money. 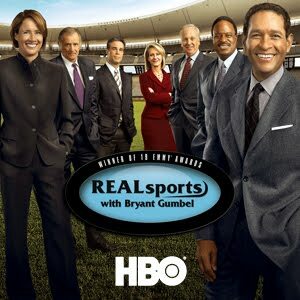 Almost all of the stories are great human dramas with sports simply as the backdrop. And it gets to the point where you don’t even care what sport the segments are about — you just know that if it’s going to be a story about badminton, it’s probably going to end up with you cheering for the minority kid who overcame poverty to break into a white people’s sport and set all the records. Or whatever. There you have it, their entire formula, spelled out for you. Not about the sport, not even about the team, but about the single individual — demonstrating the principle I keep repeating here on the Benshi, that the power of storytelling rests in the specifics. And by the way, that rugby story ended up being about the ONLY openly gay professional athlete in the world, Gareth Thomas, who came out last fall. And to no surprise, the story was utterly heartwrenching as well as uplifting. The same sorts of stories exist in the world of science. They just need more people like Rebecca Skloot to dig them up. My buddy David Gessner, nature writer and literature professor at UNC, Wilmington, is on a one man driving/blogging journey going east to west in the Gulf. And meanwhile, my former co-blogger, Jennifer Jacquet, is on a similar journey, going west to east from New Orleans and reporting on her blog.